TAG Heuer Link watches were first introduced as the S/el in 1987 but was renamed in 1999 after the unusual ‘s’ shaped links within the unique bracelets. The Link collection is also one of the few that still adheres to TAG Heuer’s ‘Six Features’ principle of the 1990s: namely, a robust water resistance, a screw in crown, a double safety clasp, a unidirectional bezel, sapphire crystal and the use of luminescence on the dial. As you’d expect, these features combine to make forms that are still leading sports watches even today. Our collection of TAG Heuer Link watches features some of the most luxurious and stylish timepieces that the brand have produced to date. Combining ergonomic design with sharp femininity, the timepiece is as versatile as it is attractive, with an easily adjustable bracelet and fluid, y-shaped links. 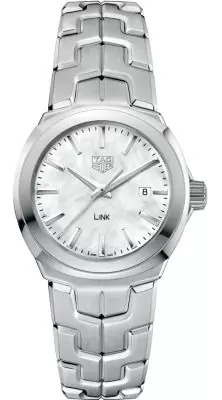 The bracelet is fundamentally designed for comfort as well as for aesthetics, making TAG Heuer Link watches as suitable for wearing during running and gardening as it is for as a dress wear at a formal event. Included within the series of TAG Heuer Link watches are several different material and colour variations, but all are based on that one original iconic design. All TAG Heuer Link watches are provided with a quartz movement for increased precision and durability, includes a water resistance of 100m, and has a neatly-sized case of 24mm, bucking the current trend for oversized timepieces and retaining more of a classic, timeless appeal. 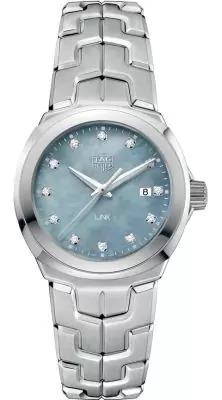 TAG Heuer Link watches are also available in a number of design and colour choices, including those with 3N gold plated and diamond hour markers, fine-brushed and polished steel and 18k yellow gold materials, and the option of diamonds surrounding the case. Many include white mother of pearl dials, although there are variants that utilise other hues as well. Whatever you’re looking for, there’s a Link watch that’s likely to suit your preferences. Banks Lyon Jewellers are pleased to be authorised stockists of TAG Heuer watches, ensuring that you have 100% guarantee of authenticity when purchasing from ourselves. If you would like more information with regards to availability or prices of models from our series of TAG Heuer Link watches, or would like to take advantage of our 0% finance options, where a wristwatch can be purchased over a timeframe of up to 48 months with a deposit amount that begins at 10%, then please email personalshopper@bankslyon.co.uk and a member of our team will be in touch.